If you have a garden with a lot of delicious ripe but still firm tomatoes and you wish to save the for the winter, this is the perfect recipe for you! I used San Marzano Tomatoes, but if you have only cherry tomatoes this will go as well simply skipping the peeling procedure and starting form point 9; reduce time and heat as need until the tomatoes reduce their juices but don’t turn to dry. These slow-roasted tomatoes are fancy food ingredients which can be served as appetizer or addition to sandwich, salad, or pizza. Bring water to boil in a big pot (about 2/3 of pot content) . Prepare a big colander that fits in the pot. Fill the kitchen sink with cold water, adding ice if possible. Make a cross incision on tomatoes peel using a sharp knife. Place tomatoes in a colander. Place the colander in the hot water. After 30 seconds remove from the hot water and place them in the cold water. Leave them again for about 30 seconds then remove them and sit them somewhere to drain and rest for a couple of minutes. Remove seeds with their water. Place cut side down on a baking sheet and bake for approximately one hour at 150°C/300°F. Serve with olive oil and sprinkle some salt and herbs or preserve these in jars. Tightly pack the confit tomatoes and with their juices into 500 ml jars within 1 cm of the tops and screw on lids. Place in a large, heavy-based saucepan and pour in enough water to cover the jars, then bring to the boil. Reduce the heat and simmer gently for 40 mins. Turn off the heat and leave to cool in the water. Christmas time is approaching the inspiration to decorate is growing. Looking at beautiful cakes and sweet I found I need almond paste to make my experiments. The almond paste from the shop near my house sells delicious almond paste which is perfect for baking but not really for modeling. New project: an almond paste deer! The easiest and best solution was preparing this myself: no oil adding better only egg white as this will dry and my creations will keep their shape easily and it’s not sticky to our hands! Bring 500 ml water to boil add your almonds and wait 2 minutes. Remove 3/4 of the hot water and cover the almond with cold water. Remove the skin of the almonds squeezing the almond out of the peel. Place the almonds on a towel and rub until dry. Place almonds in a food processor grinding them very fine. Add egg white and bitter almond aroma. Pulse until assembled, check if it is not sticky. If needed add more powdered sugar and pulse again. Remover from the food processor, form a ball and wrap in plastic foil. Your almond paste is ready to be used. Recently I got a batch of fresh organic lemons from the garden of friends and I really could not resist trying the preparation of a refreshing marmalade. I googled here and there to get enough knowledge in order to prepare something I knew everybody would love and something I could prepare as a gift for friends especially for my Christmas baskets. My Greek lemons were quite huge, around 250-300 each, thick zest and not so many seeds. The smell was so intense and delicate at the same time that I had to try to preserve it in a jar for next months! This recipe does not need additional pectin as the seed and the filaments are the source of the jelly. Well, as I supposed, my lemons did not have a lot seeds, so I needed to cook the marmalade a bit longer (not 20 minutes as “usually”), but it worked and the result is amazing. With 4 lemons I got 4 small jars of about 200 ml. The quantity is easy: same amount in weight of lemons, water and sugar. Be aware that the amount of water will be reduced while cooking and I did not add more water. You don’t need to use exactly 1000 g lemons and so on, adjust the quantities of water and sugar according the weight of the lemons. Wash well your lemons and scrub to remove the impurities if any. Place some metal spoon into the freezer for the jelly test. Measure the weight of the lemons and place them into a pot with the same amount of water. Bring to boil. Boil until you feel that the zest is soft. This takes about 30-40 minutes. Remove the lemons from the water to cool down for about 15 minutes or until they are not too hot for you. Don’t discard the water. If necessary sieve the water and clean up the borders of the pot. Halve the lemons with a knife and with a spoon out the flesh with the seed and give this over a sieve placed over a bowl. Remove also the stem and filaments; place them into the sieve as well. Cut the zest into strips and slice it. Put the sliced zest back into the water as well as liquid dropped from the sieve and the sugar. Bring slowly to boil, in the meantime work the remaining into the sieve with the back of the spoon in order to press out as much as possible. Place the leftovers into a small cheese cloth and hang it into the pot. Note: I used a stainless steel tea ball. While boiling you will see that the zest will turn translucent and the liquid clearer. When you feel that the jelly begins to form, drop a few drops into a frozen spoon and you will see if turn hard enough: push your finger through the drops and you will see the marmalade’s surface will wrinkle if it is set. My lemon did not have a lot of seeds which are the source of pectin so I had to boil for about 40 minutes! Fill your sterilized jars if possible with a jar funnel close them immediately and place them upside down on a safe working place. After 10 minutes invert them again and let them cool down completely to set. I love to keep some preserved lemons on hand for Moroccan food; I love especially chicken and olives recipes with preserved lemons. You can use them for other kind of meat as for example lamb and fish, but it is also great for dressing and marinades. Chopped preserved lemons in salads (skip the vinegar). I also replace lemons in savory recipes when I don’t have the fresh ones and I wish a quick change. In a restaurant once we got some couscous with meat and topped with some fine strips of preserved lemons, looks beautiful and it’s delicious! Rinse and dry lemons; trim tips of stem ends, starting at blossom end, cut each lemon lengthwise in quarters to within 1/2 inch of stem end, leaving all 4 pieces attached if you have big jars; if not separate the quarters. Distribute half the remaining sea salt onto the cut flesh. Distribute the remaining salt on the bottom of the jars. Pack the lemons in and add the bay leaf as well as the spices around the lemon pieces. Top with the remaining sea salt and press down the lemon pieces to release some juice. Fill the space with the lemon juice. Store in chill and dark place (shake form time to time during the first week) for at least 6 weeks or up to 1 year. Spoon sweet are very popular in Greece. Amalia gave me this recipe and explained me that to make this frigs preserve (Γλυκό του κουταλιού Σύκο) it’s necessary to pic the figs until they are still green and unripe at the beginning of May. Only in this way they will maintain their shape after cooking and will not turn mash. For a bright green color she suggested to use copper sulfate in the first water, I simply skipped this as the green color was not a priority for me. Serching in the internet I found exactly what she told me about the copper sulfate on: http://cretangastronomy.blogspot.ch/2011/05/blog-post_06.html (use the google translator or other online translator if necessary). It’s interesting that our friends who gave us the recipe, told us to take the figs from wild figs three, not too big and still firm of the size of about 2 cm before they begin to make seeds. Wash and trim the stems of the figs. Place them in a large pot, cover with the boiling water, bring to boil and let them sit for 15 minutes. Drain and rinse with hot water. Clean the pot to remove the sticky latex. Pour figs again into the pan, cover again with boiling water, boil for other 5-15 minutes and repeat 2-3 times until the figs begins to turn tender. At this point the figs will turn yellow brown unless you place 1/2 teaspoon copper sulfate (I don’t recommend this!) in the first boiling water (see step 2). Drain the figs one last time and spread out on a big cutting board to dry and poke a hole in each fig with a thick nail. Bring the sugar with 600 ml of water, lemon juice, vanilla and cloves slowly to boil, add figs and simmer at low heat for about 5 minutes. Remove from heat and let soak overnight. Remove figs from syrup, place figs in jars and bring syrup to boil until thick. Check the syrup before filling. Syrup test: drip a little boiling syrup onto a cold plate, if the drops do not spread, the syrup is ready (temperature 105°C/220°F). If the syrup did not pass the test, cook again (without figs) until the test is OK.
Pour boiling syrup over the figs in the jars, close immediately and place “head-down” to cool down. 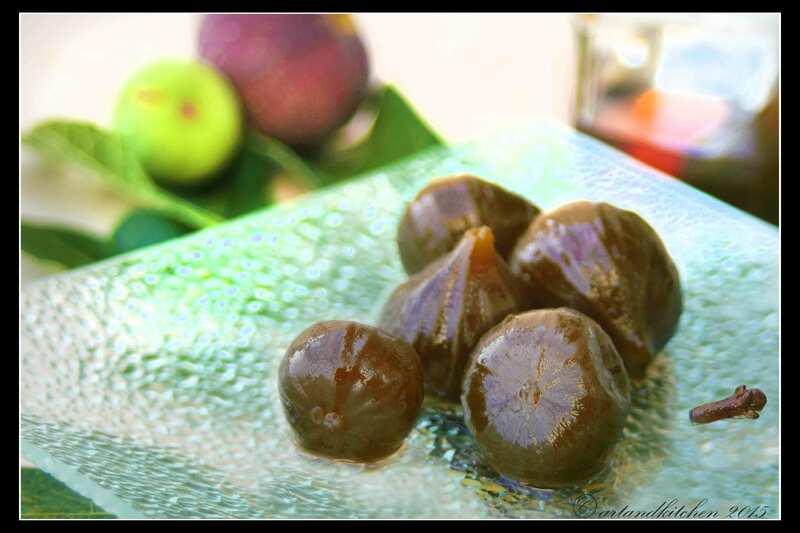 Alternative: fill figs with syrup into jars, seal and sterilize in boiling water for 30 minutes. Store in a dark cool place for at least 2 month before enjoying them!